A modern sexier interpretation but incorrect since she was very rubenesque. 紫羅紅裙配胭脂, Her purple gauze silk and scarlet skirt match her rouge. 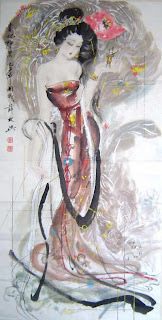 金釵翠玉鎖黛雲, Golden hairpins and jade clasps lock in her ravenous hair. 漫舞輕騰霓裳曲. As if she was dancing lithely in the air to the tune of the "Rainbow Skirt". I had the gem of an idea to this poem while jogging up the street. This is the result of going through several versions. 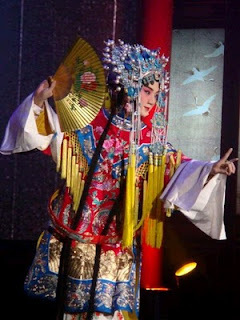 The tune of the "Rainbow Skirt and Feathered Dress" has 36 movements and was reputed to be the composition of the Tang Emperor Yuan Tsung. The music and the dance were lost in the An Lu Shan rebellion. As it was considered as an ill omen piece of music and sign of decadence that it was never revived in the succeeding reigns of the dynasty until two hundred years later, when it was revived and improved on by the Overlord and Lady (李後主大周后) of the Later Tang (a totally different dynasty but shared the same last name). When Nanjing fell to the Sung forces, the Overlord Liyu ordered it destroyed. In 1186 during the Sung Dynasty, The 18 movements were rediscovered by 姜白石(姜夔) in Changsha. Whether it is the melody or the lyrics survived to this day, I do not know. More or less historically correct of the kind of dress worn in the T'ang period. Note the similarity to the kimono of which it was modelled upon. Most of the Japanese culture was adopted from the T'ang Era. Another excellent example is the Gagaku Imperial Court Music. 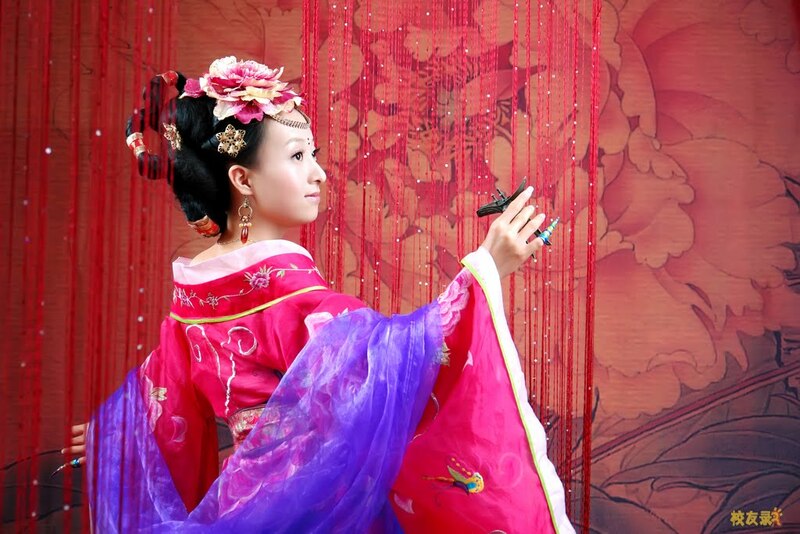 Yang Gui Fei - Imperial Concubine Yang was considered to be one of the four greatest beauties in Chinese history. All had tragic lives and hence the saying, "Since time immemorial, a great beauty, a tragic life." 自古紅颜多簿命). Her story is well known to Chinese children (not those solely brought up in western education) as Hansel and Greta is to western children. When she died, she caused an empire to collapse around her skirt. 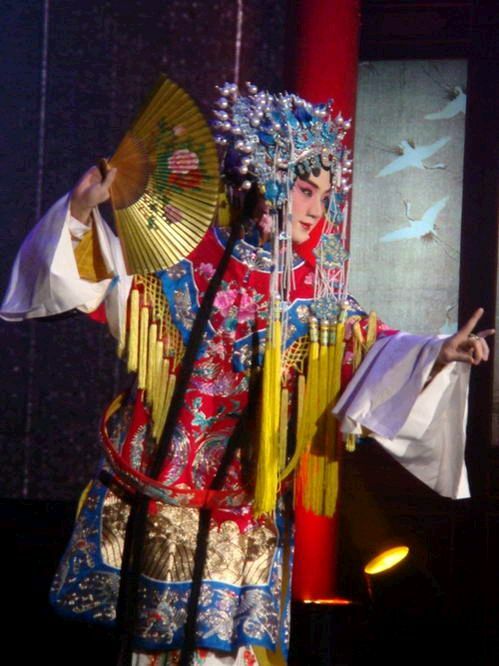 Peking opera interpretation of the imperial regalia of the Ming Dynasty as perceived by the common people. "The Drunken Concubine", also known as the "Hundred Flower Pavilion" (百花亭) is a Peking opera. It was first played during the reign of Emperor Chien Lung in the Ching Dynasty. 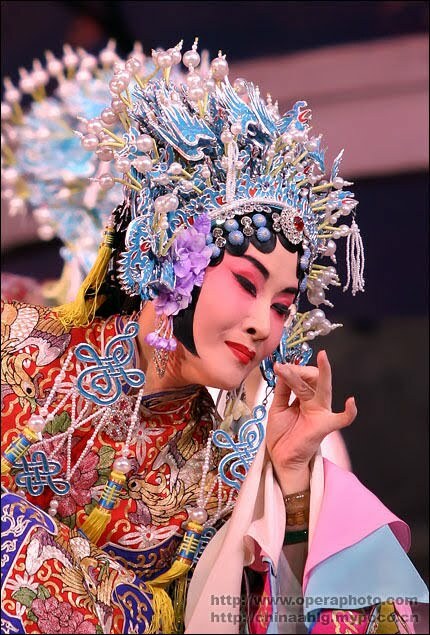 The role of the imperial concubine to date was best performed by a man - Mi Lan Fang (梅蘭芳). In the old days, like Kabuki, women are not allowed on stage. A close up of the headdress and costume. It had been more than five years since I first composed this poem. Only one character was changed to make the second and fourth line rhyme without changing the original intent of the poem. 漫舞輕騰霓裳韻 As if dancing lithely in the air to the tune of the "Rainbow Skirt". Decked in golden hairpins and jade clasps, she's like the Goddess of the Moon. Floating lithely in her rainbow skirt,she plucks off an Osmanthus bough.